This auction will end at 9pm EST Friday, November 15th! To prevent sniping, the auction for each individual item will continue beyond that time until no one has bid on that item in the prior 30 minutes. I’m not going to be that guy that creates accounts on Scaper forums just to advertise an auction, but if there are any members out there unopposed, a nod would be appreciated. 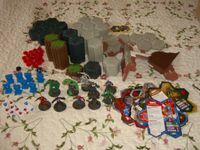 All but one item in this auction are unopened and are in great shape. The Conflict Begins is a thrifted item and pictures will be available under its entry. 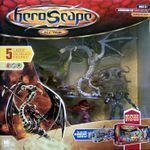 I haven’t been following the value of Heroscape items for some time. So let’s just start with a buck and see where things go, shall we? Bidding is open to US and Canada addresses only. All bids must be in whole US Dollars. Bids will only be accepted with a post to this GeekList. Payment is by Paypal only except for local pickup, in which case cash will be accepted. 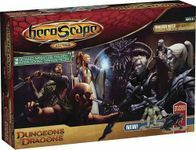 All sales will be made through the BGG marketplace. For online transactions, if payment is not received within 3 days of Marketplace confirmation, I reserve the right to offer it to the next highest bidder or cancel the transaction. Winner pays shipping costs for the cheapest USPS option reasonable for the game (Priority, Flat-Rate, Regional Flat-Rate, First-Class or Standard Post). I have a postal scale and can print Priority labels online, so you receive the Priority Mail discounts and free delivery confirmation where applicable. Insurance is available upon request. I have a supply of all the free Priority boxes, a supply of standard boxes (14x14x6, 20x14x6, 14x14x14 interior dimensions) and I have been collecting random boxes from work. Please use the USPS calculation tool if you want to check the options, especially if you are one of our northern brethren. Borders can make for sucky rates. Your items will ship from zip code 27127. Local pickups are welcome if you find yourself in Winston Salem, NC within a reasonable time after the auction closes. Combined shipping will be available for multiple items. In that case, I will try to find the best packaging available to keep costs low for you. Delivery confirmation will still be required for combined shipping. Thrifted copy. Box shows wear and tear typical of thrifted games. 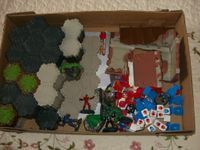 Components are loose in the box but are complete and are in excellent condition. Possibly unplayed, possibly lightly played, I have no idea. See pics below of actual item. Additional pics can be made upon request, just ask! Unless I'm missing something, this appears to be misprinted packaging. It is printed as "D12" instead of "D2", but there was never a "D12" set made. See pic below.